The cookbook is the first pictorial, gastronomical travelogues published, with recipes and menus from restaurants, hotels and railroads that no one else had been successful in acquiring at the time. Iconic photographers including William Claxton and Eliot Elision helped document these adventures. 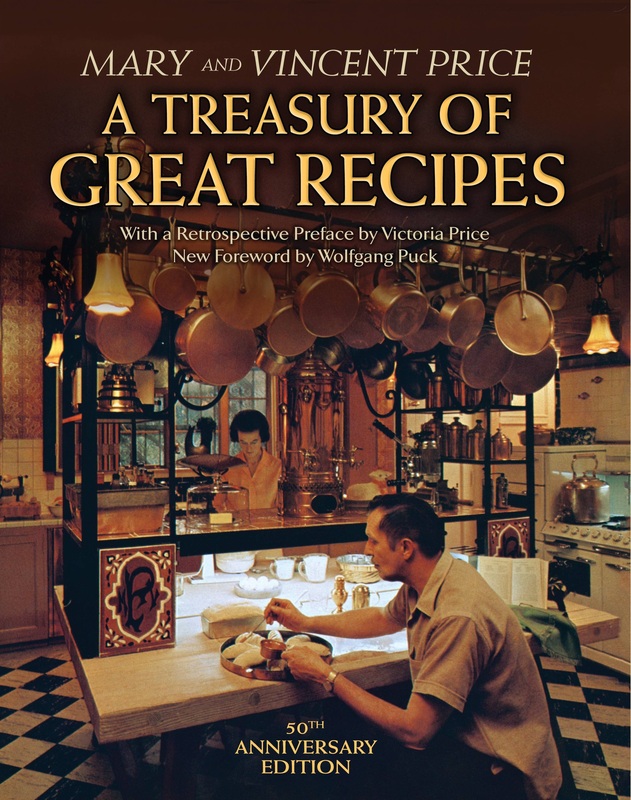 In addition to fun, vintage recipes, you can see some great pics of Price, his home, and get other entertaining tips, like how to fold napkins into Lotuses. I’m thrilled to get to show off one of the recipes here on Geeky Hostess, just in time for Halloween. Make yourself some Vincent Price-approved pumpkin seeds! In a saucepan mix: 1/4 cup curry powder, 1/4 warm water, 1 clove garlic, finely minced, 1 teaspoon salt, and the juice of 1 lime. When smoothly blended, add: 1 cup water and heat, stirring constantly, until liquid shimmers. Preheat oven to very slow (225 degrees F.). Spread pumpkin seeds on a cookie sheet, dot with butter and sprinkle with sale. Toast in very slow oven until crisp.